I have discussed Exercise for Eyes in this article . Today, I am going to discuss on how to strengthen eyes with the help of yoga. According to Swami Vivekananda there are four main streams of Yoga namely Jnana Yoga, Raja Yoga, Bhakti Yoga and Karma Yoga. To give the radiant look in eyes, do these yoga exercises at least four times in a week. 1)Sarvangasana: Sarvangasana (Shoulder Stand Pose) comes from the Sanskrit word Salamba means supported and Sarva means all, anga means body part and asana meaning posture or position. In this yoga, person lie down on the back and lower body is lifted up and hands support the lower back. 2) Matasyasana or Fish pose: A counterasana of Sarvangasana, Fish pose or Matasyasana is a backbend. Here a person lie on the back and lift the chest up keeping their bottom and neck down. 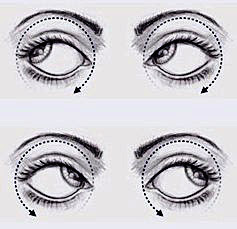 Due to the position blood flows towards upper body giving the benefit to eyes. 3) Kurmasana or tortoise pose: Kurma meaning turtle or tortoise in Sanskrit. In this, person sits with legs wide apart from each other, knees bent slightly. Forward your body and take your hands under the legs to behind and face downwards. 4) Padahastasana: Padahastasana or hand under foot exercise is also good for eyes. In this yoga, person stand erect, slowly talking hands downward bending the body and taking hands below the feet. 5) Ardha Cakrasana: In this yoga person stand erect and bend head backwards holding the hands on the waist. 6) Closing eyes halfway Yoga: Close your eyes halfway down. You will notice that your upper lids constantly tremble with different amplitude. Concentrate your efforts on stopping this trembling. (Little hint – it will be easier to do if you look at further objects). Slowly close your eyes, like your eyelids are made out of puffy cottony clouds. Think that your eyes get extremely comfortable in their position. The blood filled with the oxygen flows through your eye sockets. When you inhale imagine the breezy oxygenated air coming through your nose into the eyes. Exhale through the mouth. Breathe this way for one or two minutes and end this exercise with a smile. Give 20 minutes in a day to do these yoga for at least four times in a week. It will refresh your eyes and will help in keeping it healthy for life.